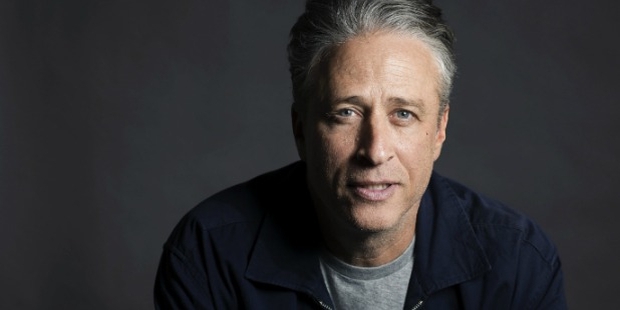 Jon Stewart is an American comedian, writer, producer, director and television host. He was the host of The Daily Show on Comedy Central from 1999 to 2015. He started his career as a stand-up comedian and entered the television industry as the host. He later went on to host his own show called The Jon Stewart Show and You Wrote It, You Watch It. He has won eighteen Emmy Awards for The Daily Show aired on Comedy Central. Stewart announced that he would be leaving the show before the end of 2015. The final episode was aired on 6 August 2015. Stewart was born on November 28 1962 in New York City. His parents divorced when he was eleven. He graduated in 1984. He majored in chemistry and later switched to psychology. After college he took up different jobs including contingency planner for the New Jersey Department of Human Services, a caterer, a bartender and a soccer coach. Stewart was reputed to being a funny man in school. He returned to New York in1986 to take up a career as a stand-up comedian. Stewart made his debut on stage in 1987 at The Bitter End. In 1989 he made his television debut as a write in Caroline’s Comedy Hour. 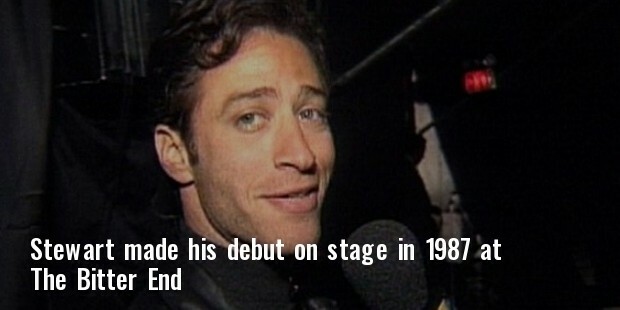 He also started to co-host Short Attention Span Theatre by 1991. In 1993 he developed The Jon Stewart Show for MTV. 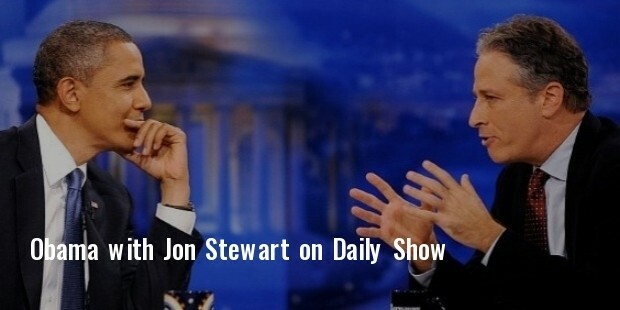 In 1999 Stewart started hosting The Daily Show that aired on Comedy Central. The show was designed to share information with the younger generation in a comedic way. In 2010, his contract was renewed with Comedy Central for The Daily Show. He appeared in movies with Mixed Nuts which unfortunately bombed at the box-office. He is also known to have directed and produced many projects. 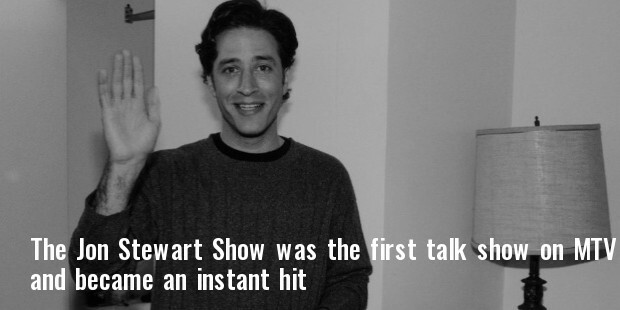 In 1993, Stewart host show The Jon Stewart Show was the first talk show on MTV and became an instant hit among the audience. David Letterman after appearing on the show signed Stewart for Worldwide Pants productions. He has won nineteen Emmy Awards for The Daily Show as a writer and producer. Stewart has written various books including Naked Pictures of Famous People, America: A Citizen’s Guide to Democracy Inaction and Earth: A Visitor’s Guide to the Human Race. Stewart met Tracey Lynn in 1997 on a blind date. The dated four years and married in 2000. 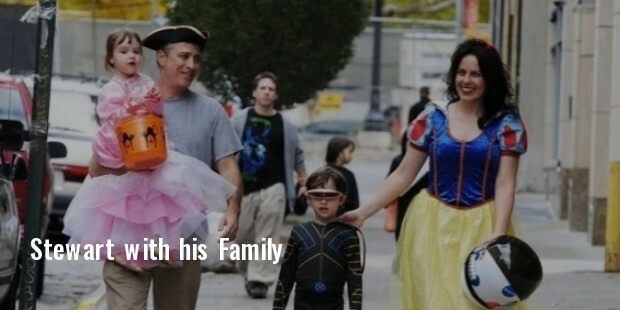 The couple is blessed with a son and a daughter. The Daily Show received Peabody Awards in 2000 and 2004. It also received the Outstanding Writing for a variety, music or Comedy Program Emmy Award in 2001, 2003, 2004, 2005, 2006, 2009 and 2011.